Why do we need a book on labs? The print portion of the project, THE LAB BOOK, presents a much-needed critical, historical and international examination of a major ongoing shift in contemporary ideas about higher education, the information technology sector and the public good. The book investigates the history of media and humanities labs as situated practices. The accompanying website delivers a synchronic overview of contemporary media labs through a series of interviews with their occupants. What is THE LAB BOOK about? We can read the influence of the MIT Media Lab into our contemporary moment, tracking how the model of the media lab has proliferated and shifted. For example,the Community Guilds STE(A)M truck is fascinating because of the way in which its name explicitly includes but literally brackets the arts and embodies a kind of neoliberal belief that education can work on an entrepreneurial model. We can also read this history backward, toward the Cold War-emergence of the military-industrial-university sector and its contributions towards the development of digital culture. As scholars like Charles Acland, Haidee Wasson and Jonathan Sterne have pointed out, there is a long history of film projectors, mimeograph machines, filmstrips, overhead projectors and other analog media playing important roles in the classroom. In terms of pedagogy in North America, we want to briefly point to several examples of analog humanities labs. 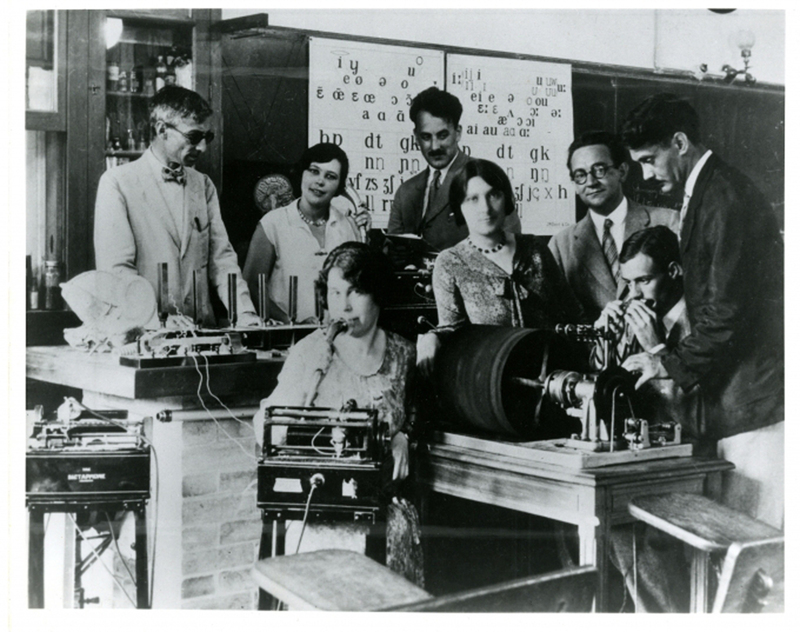 In the late 19th century, the psychophysical laboratories at Harvard stand as an early model of a scientific measuring of effects of modern media. Hugo Münsterberg‘s early work established a scientific context for the new medium of cinema, and argued for a physiological understanding of media that offered a shared ground for cinema and media theory.Language labs were also places where students sat in cubicles with headphones and phonographs or tape recorders, engaging in rote learning by recitation. In the 1960s, many universities in Canada made large investments in audiovisual technologies like reel-to-reel tape as part of a policy incentive. Home economics labs – chiefly test kitchens for experiments in food science, but also sewing labs – provide another important early example. For over a century, such labs have produced and mediated human beings as modern subjects.